I'm sorry - just checking... Is that funny to you? I unhid that so I could see what it was. He wasn't trying to be funny except in his dark cold racist heart, he was being as offensive as he could possibly be and still be allowed to post here. From serial killer John Wayne Gacy's clown art to the Volkswagen in which Ted Bundy killed some of his victims, Americans have long been fascinated with the macabre aspects of sensational killings and the people who commit them. The low strata of this trade is "murderabilia," the trafficking in sensational items from notorious crimes or killers. The online store Serial Killers Ink, for example, is currently offering letters and artwork from both Charles Manson and the BTK Killer, Dennis Rader, as well as the confession signed by Ed Gein, the man whose skin-peeling killings inspired everything from "Psycho" to "The Silence of the Lambs." This is the market George Zimmerman is trying to tap into by selling the semiautomatic he used to kill Trayvon Martin in the 2012 Florida slaying that riveted the nation. 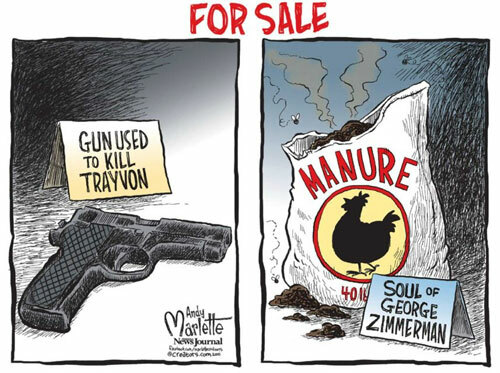 Zimmerman was acquitted in a sensational trial, the gun is his property and, legally speaking, he's free to sell it as he would any other personal item. Yeah I sort of knew that. It really shouldn't shock me anymore- the desperate hatefulness and ignorance, but sometimes I guess it still does. I knew he thought that abomination was humorous, because I remembered he thought Zimmerman acted heroically. What is it about Liberals that makes them whine "racism" every time they get backed into a corner? Can't they just admit that they have no arguments because they mindlessly adhere to a bankrupt ideology? Yeah I sort of knew that. It really shouldn't shock me anymore- the desperate hatefulness and ignorance, but sometimes I guess it still does. Not holding my breath to see if you can actually point out any hate or ignorance on my part. 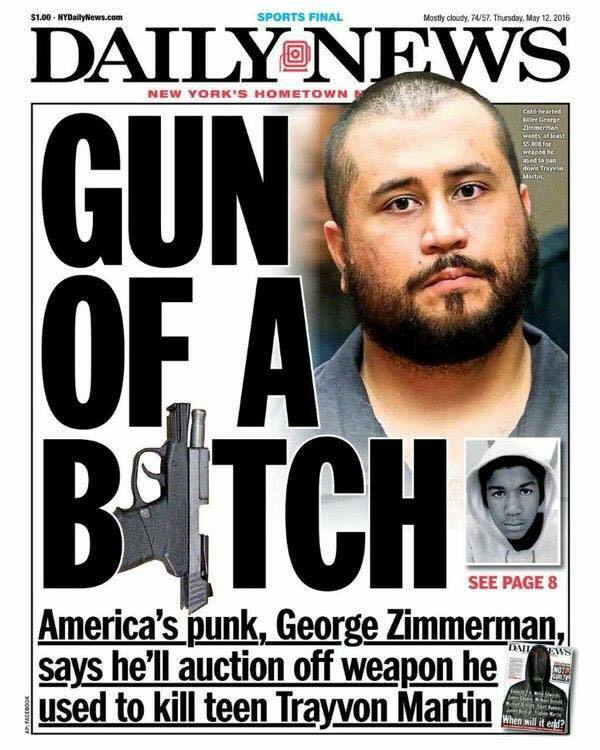 I knew he thought that abomination was humorous, because I remembered he thought Zimmerman acted heroically. Jokes are humorous. The costume was cool. That costume is hardly an abomination. It was pretty creative. oralloy, your hate and ignorance are repeatedly pointed out to you--you simply persist in engaging in denial. You've come across as being like this for quite some time--childish, stubborn, and desperately closed minded--and holding your breath, and turning quite blue, to avoid the stench of your own hate and ignorance. This ones even your size!!!!! Just a heads up. The new auction of Mr. Zimmerman's gun goes live at 9AM today (eastern time). Starting bid will be $100,000. Buy it now option will be $500,000. And neither one is worth a cent.